The Corporation of Brown University has approved a new financial aid policy that eliminates loans for students whose family incomes are less than $100,000, reduces loans for all students who receive financial aid and no longer requires a parental contribution from most families with incomes of up to $60,000. PROVIDENCE, R.I. [Brown University] – At its winter business meeting today (Saturday, Feb. 23, 2008), the Corporation of Brown University approved far-reaching enhancements to the University’s financial aid program for undergraduates. 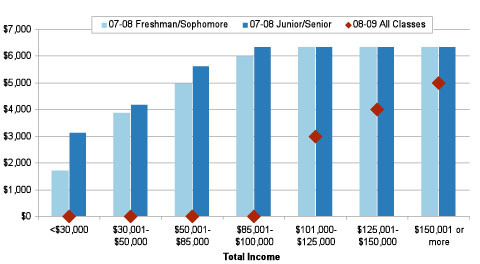 Beginning in the fall of 2008, students from families with incomes of less than $100,000 will no longer have loans as part of their financial aid packages, and most parents who earn less than $60,000 will not be expected to make a financial contribution to fund their child’s Brown education. The new financial aid also sharply reduces loan expectations for all students who receive financial aid, regardless of family income. The new provisions apply to all current students who receive financial aid, as well as to the Class of 2012, which matriculates next fall. “Since 2001, Brown has made financial aid for our students one of our highest priorities. Every year, with strong support from the Brown Corporation, we have taken steps to ensure that our financial aid programs are competitive and effective,” Simmons said. “Today, we take another major step forward to ensure that our nation’s best students from lower- and middle-income families can attend Brown and graduate without the enormous burden of college debt,” she said. Currently, about 40 percent of Brown’s undergraduates receive financial aid from the University at a cost of $57 million. The University’s budget for undergraduate financial aid, consistently the fastest growing element within the budget, will increase by more than 20 percent next year, reaching $68.5 million. The loan elimination and reduction program and the elimination of parent contributions for most families with incomes less than $60,000 alone will add $7.4 million to the financial aid budget for fiscal year 2009. Editors: Brown University has a fiber link television studio available for domestic and international live and taped interviews and maintains an ISDN line for radio interviews. For more information, call the Office of Media Relations at (401) 863-2476.